Abu Dhabi: The UAE and Armenia have agreed on exempting citizens of both countries from visas as they will be given visas on arrival at the airport. 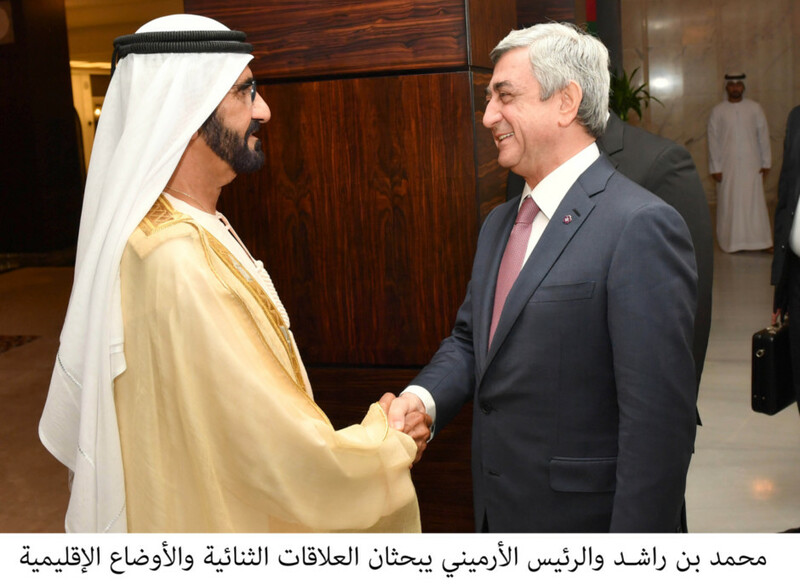 The decision came during the meeting yesterday between His Highness Shaikh Mohammad Bin Rashid Al Maktoum, Vice-President and Prime Minister of the UAE and Ruler of Dubai, and Serzh Sargsyan, President of Armenia. Lieutenant General Shaikh Saif Bin Zayed Al Nahyan, Deputy Prime Minister and Minister of Interior, and Shaikh Mansour Bin Zayed Al Nahyan, Deputy Prime Minister and Minister of Presidential Affairs, were present at the talks. During the meeting held at the Presidential Palace, Shaikh Mohammad and Sargsyan agreed on exempting citizens of both nations from entry visas, with the agreement coming into effect immediately. Shaikh Mohammad and Sargsyan discussed a number of topics concerning bilateral relations, current state of the region and issues of mutual concern. Talks also focused on ways to bolster investment partnerships between the two nations, particularly in tourism, water and agriculture.